A week is, of course, a long time in cliché land, but there really has been a tremendous lot going on in London cycling in the last week: as befits the run-up to the mayoral election, just one week away now. Cyclists, unusually, found common cause with black cab drivers, who of course also do not want minicabs in the lanes they are privileged with access to. Transport for London promptly took the matter to court, and on Thursday the High Court decided that it remains illegal for minicabs to use bus lanes, and ordered Addison Lee to withdraw its promise to indemnify its drivers against fines. But what really got cyclists angry was John Griffin's inflammatory and ignorant anti-cycling diatribe in his house magazine, in an article which came to light last Thursday, which seemed to blame cyclists killed or injured on the roads for being there at all. This lead to a petition for Addison Lee's operating license to be removed, a call for a boycott of Addison Lee, and a "die-in" protest outside the company's headquarters in Camden on Monday. There is nothing like having to share space with buses for reducing the feeling of subjective safety for cyclists. The constant "swapping over" game when you have to overtake a bus at a stop, judging whether or not it is suddenly going to take off again, then it does, just after you have passed it, and it overtakes you again, and stops in front of you again, all this is deeply tiresome and offputting to all but hard-core cyclists. 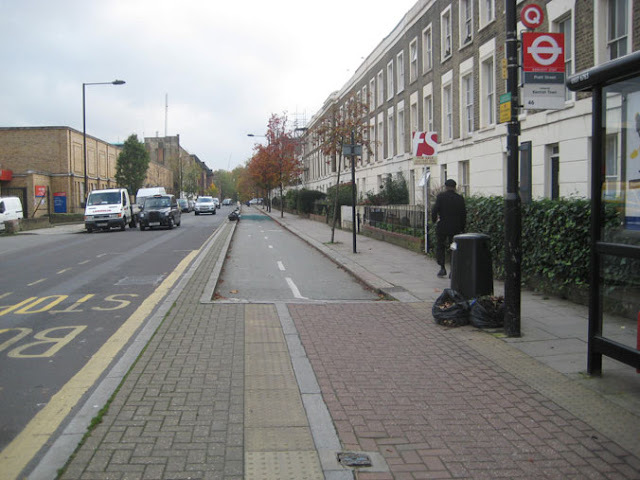 Particularly on routes where there are large numbers of buses, or they where can travel fast, buses and cyclists need to be separated to create an attractive cycling environment. There is no point in going for half-measures. If we want a "cycle-ised city" we need the proper thing. We need separate bus lanes and cycle tracks. If there's not room on a street for that, we need wide combined (separated but unsegregated) lanes where buses can overtake cyclists with good clearance, staying on the outside of them all the time. If there is not room for such wide lanes, then there should be a cycle lane only, with, again, cyclists passing behind stops. Or a lane of general traffic can be removed to make space for one of the other solutions. 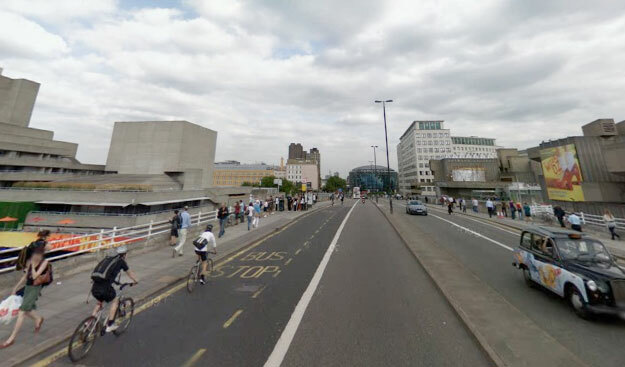 Wide combined bus and cycle lane on Waterloo Bridge, but the stop is done wrong. Cyclists have to pull out into a fast general traffic lane to get round stopped buses: better than having no lane, but very poor. Bus lanes in London and other UK cities (but most of them are in London) have always been a very poor compromise at the best of times, and cycle campaigners should not be afraid of condemning them and calling for far better provision. For one thing they are rarely operational 24/7, but only work at peak hours, so for most of the week they do no good to bus passengers or cyclists. For another, they have never been run through junctions. They give up on the approach to them, giving place to a left-turn general traffic lane. This offers no help to cyclists trying to go straight on (or indeed turn right). For a third thing, on some roads which are decreed to be too narrow to have bus lanes on both sides, they occur on only one side. An example is that choked, angry, fuming corridor that separates the boroughs of Camden and Brent, otherwise known as Kilburn High Road. 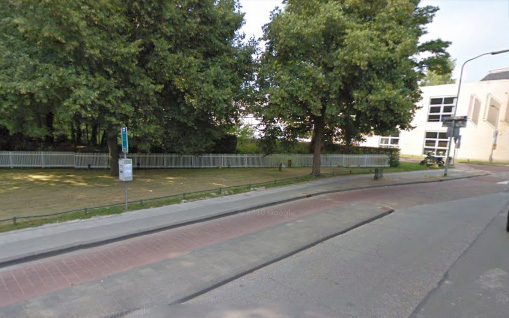 Here, the wider sections of the road have bus lanes on both sides, but where the road narrows, one or both lanes disappear. 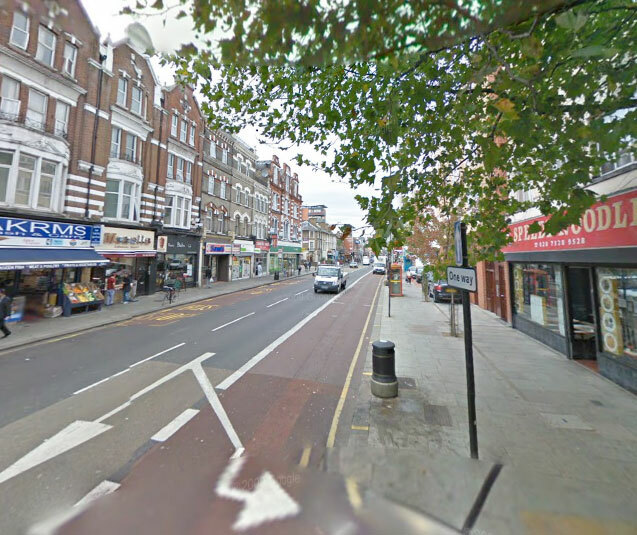 Wider section of Kilburn High Road: bus lanes both sides, but they give up near junctions because "junction capacity" (for private traffic) is considered more important than bus priority and cycle safety. This is all a pathetic compromise. If bus lanes are worth having on a road, they are worth having on both sides all the way along. If that means getting rid of the general through-traffic, or making general traffic one-way in order to accommodate adequate bus and cycle lanes on both sides, then that's what needs to be done. If not, why bother? 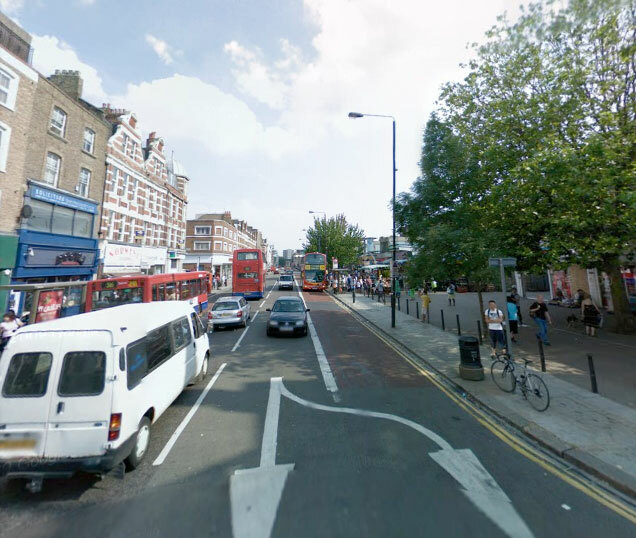 I once said to a Camden traffic planner that the best "Dutch" solution to the problem of Kilburn High Road would be to make it one-way, except for buses and bikes. He thought for a while and then said, "But what do you do with the other direction of traffic?" But worrying about the other direction of traffic, most of which shouldn't be there anyway, is part of the problem. If we really wanted bus priority, we would just do it. Bus priority in London, even separating it entirely from cycling considerations, has always been hideously compromised and ineffective. Trying to incorporate cycling on this flawed network doesn't work well at all. We need to re-think it all along Dutch lines. The thinking behind bus priority in London was always insufficiently radical to really make much difference to anything. There was never any concept of the lanes being truly dedicated and continuous. It should be realised that the modern move towards extensive bus lanes in London started before the establishment of the GLA and TfL – in fact, under a Conservative government in the late 1990s. I remember this, as I was involved with LCC campaigning at the time. Representatives of the Livingstone administration in City Hall tend to claim bus priority as his achievement, and he always was quite committed to buses, but he only extended a trend that was already occurring when he took office, financing it with his congestion charge revenues. At the last Street Talks meeting, at which Ashok Sinha, and Richard Lewis of London Cycling Campaign talked on the Going Dutch campaign, in questions from the floor, Livingstone's one-time Deputy Mayor, Nicky Gavron, who clearly has little grasp of cycling issues, seemed to want to claim the bus-lane installing record of the Labour London administration as a great achievement for cycling. She was quickly disabused of this idea by the cyclists chiming in to say how unpleasant they found it to cycle in the bus lanes on London's main roads, and how they would not let their children do it. Yes, bus lanes are sometimes better than congested general traffic lanes because they are sometimes less full of traffic. But they are no basis on which to build a Dutch-style "eight to eighty-year-old" cycling culture. Let us be clear, if we want that, we will have to do some surgery to London's bus lanes, and in some places we will have to get rid of them: particularly where they don't work well anyway. So I think cyclists should be less worried about Mr Griffin and his bus lanes campaign, and more concerned about the politicians who are supposed to be protecting cyclists, and who are failing in that duty. Like the minister for road safety, Mike Penning, and the minister for cycling, Norman Baker. The Commons Transport Select Committee interviewed them on Tuesday, in a session closely watched by campaigners and journalists alike, in the wake of the huge publicity for the "cyclesafe" agenda created by The Times. But the hearing was an abysmal affair, in which it became entirely apparent that this government has no strategy on cycling, no programme to make it safer, and actually no understanding that there is a serious problem – so serious that it has caused a traditionally conservative newspaper to embark on a "crusade". For cyclists we are also seeing in an improvement in the fatality rate per mile travelled, but, in comparison to overall road safety casualty data, in this area we are behind many other European countries. 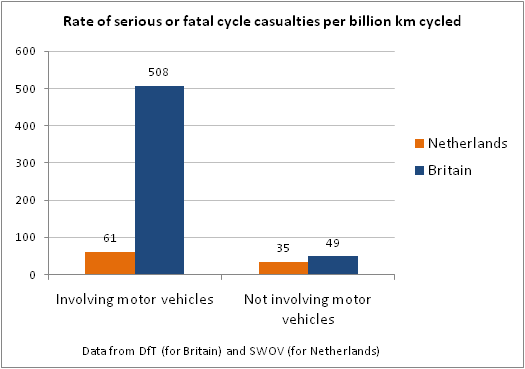 How extraordinarily far behind we are is demonstrated by statistician Jim Gleeson in this tremendously important blogpost, where he shows that the chances of a cyclist receiving a serious or fatal injury in a collision with a motor vehicle is, per km travelled, 8.3 times higher in the Netherlands than in the UK. "I thought Penning's comment on Dutch success showed sheer contempt for the lives of UK cyclists". I think that's not too harsh. Penning has shown appalling ignorance of his brief before, when he appeared not to know that he was in charge of roads (trunk roads) that cyclists legally use – in some cases, have to use, because of a lack of more suitable alternatives. He has, in his past political life, been associated with the far-right anti-EU Tories who had the whip removed by John Major. He is therefore not one likely to look to continental Europe for solutions to problems. I would have expected a bit more sense from Lib Dem minister Norman Baker, but this was conspicuously lacking. In another comment Baker gave us the self-fulfilling prophesy, comparing British towns to Leiden, with 13,000 bikes parked at the station, that "We're never going to get to that situation", prompting the retort from @citycyclists "Because of you, minister". Both Penning and Baker plumbed a new low of indifference to those for whose safety they are responsible. In the national media, apart from The Times, the select committee on cycling was largely eclipsed by the Leverson enquiry into the doings at News International, and speculation about the position of Jeremy Hunt, the Culture Secretary. But if there are any politicians who should have been disgraced enough to lead to resignation on that day, it was Penning and Baker. For while nobody has died as a result of the News International affair, avoidable cycle deaths happen weekly. The most recent occurred in Bedfordshire on Sunday. The only consolation I can think of is that ministers like Baker and Penning rarely remain in their jobs for more than a couple of years. They really are, to quote Sir Robin Day, "Here today, gone tomorrow". So where does all this leave us? It looks unlikely that, unless there is an irresistible public upsurge of sentiment demanding it, this Con-Dem coalition government will ever adopt a worthwhile cycling policy. Perhaps The Times campaign will achieve even that eventually, but it still appears a remote possibility. As a result of the newfound zeal of campaigning organisations, and the real upsurge in cycling in inner London, and perhaps even the negative publicity arising out of the Addison Lee affair, more of the mainstream media is starting to understand what the real differences between UK and Dutch roads policies are, as demonstrated in this broadly excellent piece by Jasmine Gardner in the London Evening Standard, clearly inspired by LCC's Go Dutch campaign. But with central government intransigent, the only hope of progress lies with the devolved administrations in London, Scotland, Wales and Northern Ireland, and possibly some of the large English unitary local authorities like Manchester and Bristol. These administrations and authorities have big enough budgets, and have enough freedom, and strategic control, to start to set a new direction for their roads and streets policies, even if Westminster keeps its head in the sand-bucket. The Lib Dem and Green candidates for Mayor, Brian Paddick and Jenny Jones, have already agreed to these demands. Boris Johnson, the independent candidate Siobhan Benita, and the UKIP and BNP candidates, have not. Unless he changes his opinions sharpish, Boris Johnson will continue to be a disaster for London cycling. Statistics on cycling casualties show falling casualties between the year 2000 and 2007. In 2008 Boris came into office and casualty rates started climbing. It’s no coincidence. His policy of ‘smoothing traffic flow’ has made roads agressive and more dangerous... At last week's Sky Mayoral debate, Ken and Brian made valid points about cyclist safety, and Boris made a joke. And the Go Dutch petition now has nearly 40,000 signatures, corresponding to 2% of those who voted in the elections last time, less than the difference between the two main candidates in some polls. It's all to play for, this week has been a long one in London cycling politics, and next week could be even longer. 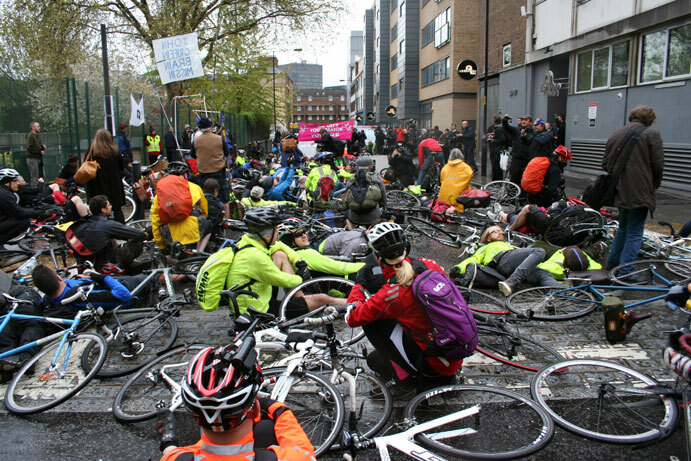 If you are within reach of London, do your bit and turn up for The Big Ride tomorrow, Saturday, demanding London's streets be made safe and inviting for cycling as they are in Holland. Organised start points from all over London are given on this map. Tips on how to "survive" the ride are given by ibikelondon. The Vole will make the long journey from Edgware, and will see you there. Good post. Like many others, I had been falling into the trap of thinking "there goes my nice bus lane" or more radical (not!) "why not ban black cabs from bus lanes as well?". I did not immediately think - "bus lanes aren't that great actually." I have been converted, largely by this blog and Copenhagenize, from a mixture of defeatism over Dutch style provision ("not enough space, wouldn't work here") and blindness to the evidence ("it's not so bad, people would find it OK once they had a go"). That's despite having been to the Netherlands, and despite the obvious fact that the overwhelming proportion of the population aren't prepared to ride bikes on roads as they now are. Yet even so, my initial reaction to the AL fuss, was as set out above. Seems like we have a lot to do in educating people who currently cycle, let alone anyone else (even typing that, I initially typed "cyclists" like they're some sect). On a lighter note, you may or may not have heard that Mr Griffin of AL was unable to attend an interview with the Today progamme this morning and had to do it by phone - he was stuck in traffic (or was helping to cause a traffic jam if you prefer).